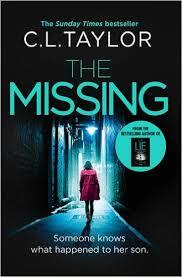 BleachHouseLibrary.ie: Book Review - "The Missing" by C.L. Taylor. Fifteen year old Billy Wilkinson disappeared from his family home six months ago. His mother, Claire is preparing to hold another television appeal in the hope of jogging someones memory. Her husband and older son are not as hopeful as Claire and she feels undercurrents of defeat within the walls of her house. A mother can't ever give up hope of finding her missing child, can she? Who can she blame for the disappearance? Was there someway she could have prevented it? When her mind starts playing tricks on her, and she finds herself waking up in strange places with no memory of how she got there, Claire realises there is a chance someone has been lying to her. Can she discover who is hindering her search for her son, and will it be too late? The third psychological thriller from the author of The Accident and The Lie, and C.L. Taylor addresses every parents biggest fear; the disappearance of a child. While Billy is fifteen years old, and bigger than his mother, he is still her baby. The pain felt by Claire is palpable, the uncertainty,the fear and the empty spaces in her everyday life. Her husband, Mark, seems resigned to the fact that he may never see his son again and his deflation becomes an issue within the Wilkinson household. Older brother, Jake, is struggling to control his moods and turns to alcohol to numb his pain. His live-in girlfriend, Kira, can only watch his slow spiral into depression. Overall the atmosphere of the novel is dark. There are Snapchat messages throughout the book and it is left to the reader to decide who the users are. This is a clever way to identify with the situation, outside of the household, adding a new perspective. When Claire begins to literally lose parts of her day and finds herself with more questions than possible answers, the darkness seems to extend beyond the scope of grief or stress. The mind is a funny thing, and hers seems to be telling her something. The Missing is published by Avon Books on 7th April 2016 and will be available in paperback and ebook format.